This beautiful looking brick tower which looks like a chimney is actually a tower used to make lead shots or round pellets for guns. The technique is very simple and was in use from about 1782 to middle of 20th century and employs the simple principle of physics that due to surface tension, falling liquid droplets take an almost round shape so as to offer minimum resistance to the air. Molten lead has a higher surface tension than water so its droplets are almost perfect spheres. In 1782 an English plumber named William Watts saw possibility in this phenomenon and started a buckshot factory. 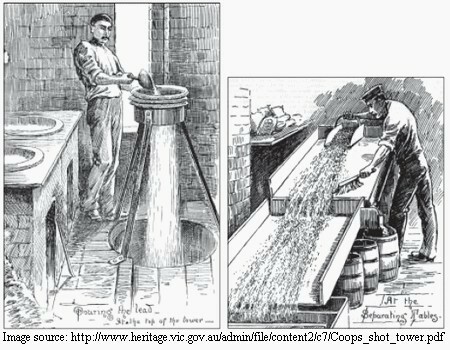 In a lead shot factory molten lead used to be poured continuously through a pan with calibrated holes. A mechanical rapper tapped the pan to help discharge of the molten lead. Molten lead drops falling from height formed into spheres and were collected in a water trough at the bottom of the tower, thus quickly solidifying without deforming. The lead shots were then collected and shovelled on to the slightly tilted sorting tables. Perfect spheres would roll down straight to the bottom of the table while the deformed ones would roll to the side where these were collected and re-melted. The spherical pellets were sorted for size with sieve of standard sized holes and then transferred to a revolving drum for polishing with graphite to provide lubrication and to prevent oxidation. 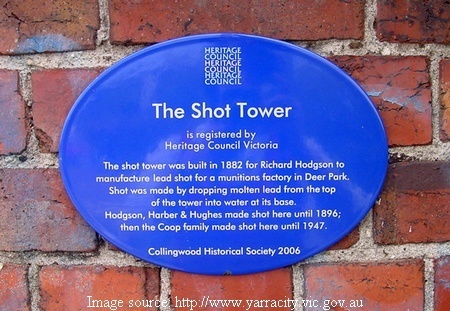 The Shot Tower shown above is in Alexandra Parade, Clifton Hill in Yarra, a suburban city of Melbourne and was constructed circa 1882. It is reportedly tallest in the World having a height of about 80 metres. The shaft is finely decorated around the openings and at various levels, with polychrome patterns and decorative brick bands and is topped by a small pavilion. It remained functional till 1947. Now a days lead pellets are made by feeding calibrated lengths of wire into hemispherical dies and stamping them into spheres. The tower is incorporated in Victorian Heritage Database. Nice work - funny how it takes someone from another land to notice the things we take for granted every day. In a sense with Internet and Google Earth, the whole World has become a small village and I treat myself as local to all the places in this World. Nice post. Never heard of these kind of buildings. If i got passed it i would have thought it was just a chimney.